Are you searching for a tasty roasted chicken or fried chicken? I think this savory chicken recipe is the one you are looking for. I think this recipe is as tasty as the one served in Savory chicken restaurant. There are two methods you can use on cooking this chicken recipe. You can oven roast it if you have an oven or you can deep fry it if you don’t have an oven. But there is big difference between the two method with regards to the taste. I think oven roasting is better because there is less fat and it will be more flavorful. 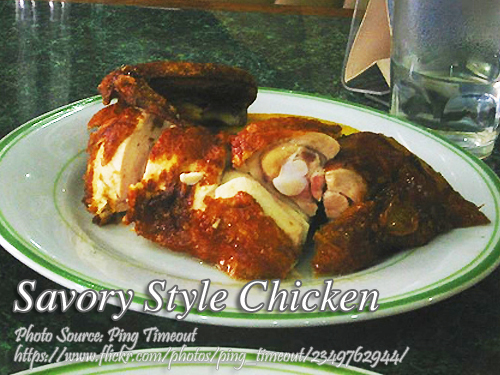 To cook savory style chicken; Mix all marinade ingredients (except bay leaves) and put in a blender. Blend marinade mixture on low until lemongrass and garlic are finely chopped. Set aside. Filter and discard solid particles of the marinade mixture using a sieve. Combine chicken, marinade mixture and bay leaves in a plastic zip-loc bag, marinate overnight in refrigerator. The following day, stuff chicken with lemongrass. Let stand for about 30 mins. Roast chicken in oven at 425°F for 1 1/2 hour (Note: a better way is to use a probe thermometer and when the internal temperature of the thickest part of the chicken reaches 175°, remove the chicken from the oven). Prepare basting sauce by mixing 2 tbsp. sesame oil to the marinade, baste chicken in oven every 15-20 mins. Roast until golden brown. There are two methods you can use on cooking this chicken recipe. You can oven roast it if you have an oven or you can deep fry it if you don't have an oven. Mix all marinade ingredients (except bay leaves) and put in a blender. Blend marinade mixture on low until lemongrass and garlic are finely chopped. Set aside. Filter and discard solid particles of the marinade mixture using a sieve. Combine chicken, marinade mixture and bay leaves in a plastic zip-loc bag, marinate overnight in refrigerator. The following day, stuff chicken with lemongrass. Let stand for about 30 mins. Roast chicken in oven at 425°F for 1½ hour (Note: a better way is to use a probe thermometer and when the internal temperature of the thickest part of the chicken reaches 175°, remove the chicken from the oven). Prepare basting sauce by mixing 2 tbsp. sesame oil to the marinade, baste chicken in oven every 15-20 mins. Serve with the prepared gravy (See gravy recipe below). Mix all the marinade ingredients in a pot and pour 2 cups of water. Stuff the chicken with lemon grass and put it in the pot with the marinade. Boil until half cooked. Drain the chicken and then deep fry until the skin is brown and crispy. Serve with the gravy (see recipe below). Mix cooking oil and ¼ cup flour. Stir mixture in a sauce pan over low heat for about 4 minutes, until the color changes to brown. Mix the remaining flour into the chicken broth and pour in to the pan. Add more broth if necessary. Add salt and pepper to taste. I am convinced that Savory chicken does not use lemon grass at all! I think they are using those soup mixture of wood, herbs, etc…called sanke…or sanque! Parboiled in dark soysauce like mushroom dark soysauce foment Pearl River!…then deep fried after fridge drying to avoid spattering! What do you think? Hi Bryan, the sanke or star anise is included in the recipe above. And with regards to lemon grass, maybe you can omit it. Have you tried tongkoy?…the Chinese use this for soup! I tried tongkoy with Ngo Young (5 Spices) & parboiled in Pearl River Bridge dark mushroom soysauce sauce. Dried in the fridge and then deep fried…the “Savory aroma”…color, texture and juiciness was there! Like Original Savory Chicken! Tnx for the “no tanglad” record or suggestion! Let me know if and when you tried the use of tongkoy ..sometimes called sanque! Try it! Hi Bryan, the star anise is also called “sanque”. Thanks also for your tips. For me, the best part was the gravy! Whenever we come visit the Philippines, we would go straight to Savory. We would order 2 whole chickens and two bottles of gravy. Yep, I buy them in bottles. I just wanted to mention the bottles where they put the gravy in and it’s always consistently in a Mang Tomas Lechon Sauce bottle. Could it be that they use Mang Tomas Lechon sauce in their gravy? Hi DB, probably they are using Mang Tomas lechon sauce. Do they taste the same as Mang Tomas? Is the oven temperature right? I am getting a little nervous because it seems to be browning too quickly. Hi Rhianne, the recipe is for large chicken about 2 kilos. If in doubt, just reduce the oven temp. Which one is better to use, the five spice or the star anise? Would it be overkill to use (a combination of) both? Thanks! Hi M, it’s better to use 5 spice powder. Star anise is only an option just in case you can’t find 5 spice powder.